I've received many emails from readers asking about Cayden's birth mother. Some of the questions I've known the answers to others I didn't. I only thought it fair I ask her to answer the questions. Before I get into the Q&A I want to give a little background. 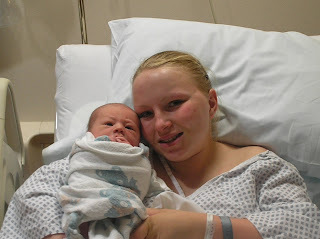 Jordan and my husband Daniel got pregnant in the summer of 2006. Daniel had just graduated from high school and Jordan had just finished her sophomore year. Daniel had just turned 18 and Jordan would turn 17 in November. 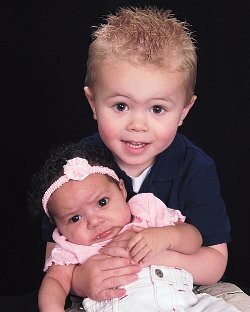 Daniel and Jordan parented together for 8 months. And then Daniel had Cayden full time. When Cayden turned 1 Jordan had visits on Saturday and Sunday until he turned 2. 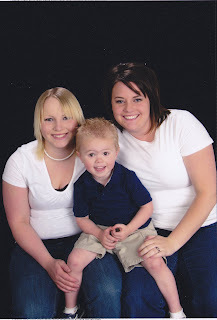 Cayden's adoption was open until January of 2011 when Daniel and I felt it was best to close his adoption. I still have contact with Jordan and Cayden talks with her on the phone, sends texts, and sometimes emails if he chooses to. He will be able to see her in person when he is old enough to understand the past. Q: When you were pregnant with Cayden did you ever consider adoption? A: Yes I did. I was only 16. I think I would have been crazy to not be scared out of my mind to have a baby. Q: Why did you choose to parent? A: Parenting was what I felt was right. I knew when I saw his face I knew I needed to be his mom. Q: How old was Cayden when you allowed Katelyn to adopt him? A: I signed the papers in February of 2010, just before my daughter was born. He turned 3 that April. Q: Who was there when you signed the papers? A: Just me and the notary. Q: Would it have been easier to sign if you had family there with you? A: Ya it would have but at the time my family wasn't exactly supportive of my decision. Q: Is your family supportive of your decision now? A: They are now but like I said they weren't at first. Q: What do you think made them become supportive? A: I think mainly time. But I also think them seeing me comes to terms with it played a part. Q: Do you wish things were different in your adoption? A: Not now but in the past. We weren't exactly nice when the process first started. I wish that was different. I also know that things happen for a reason. Q: What is the number one thing you want Cayden to know about his adoption. A: The main thing is that I love him and I did what I knew was right and best for him. Q: What is the number one thing you want for Cayden? A: To be happy and loved. Q: Do you still consider yourself his mom? A: No, I'm his birth mom now. I was his mom for as long as God needed me to be. Q: What has been the hardest part about your adoption? A: Letting go and moving on. I couldn't do that until I was ok with the adoption. Q: How has adoption changed you as a mother? A: I don't take anything with my daughter for granted. I also realized things I did wrong with Cayden and I'll never do those same things with my daughter. Q: How will you explain Cayden's adoption to your children? A: Honestly I have NO idea. I'd love some advice in that area. So... if your question wasn't answer it's because Jordan or I didn't feel the need to answer it. Also if you have any other questions or comments for Jordan you're more than willing to leave a comment... I have said it a few times Jordan is and always will be a very special person to me. It doesn't matter what mistakes have been made in the past. I have had moments where I struggle with the past but then I remember that she is struggling with the present. My love for Jordan goes deep and always will. NOTHING will change that. I love the photos. The post was great too! 2 strong women! Agreed - 2 very strong women you both are.